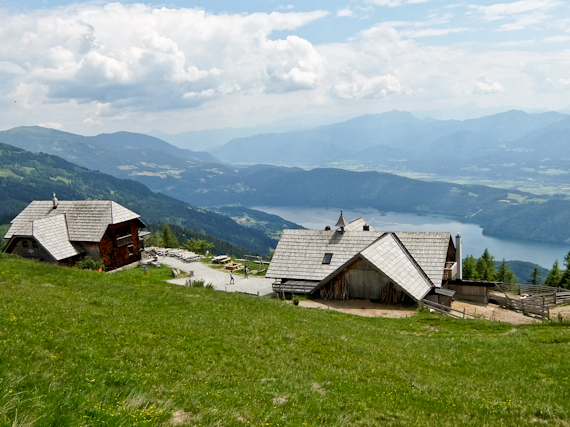 Austria has long been a popular destination for British travellers, both in the winter for skiing and the summer for hiking. 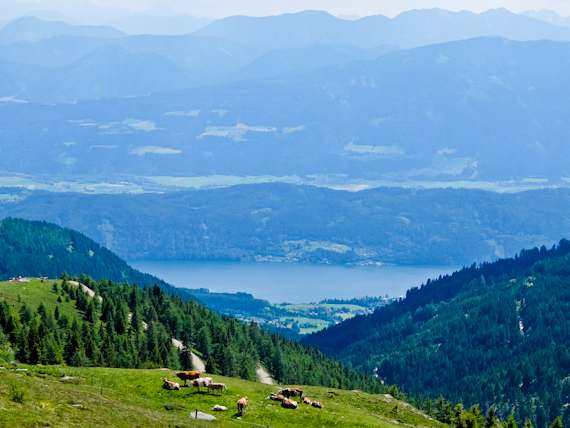 The Tyrol gets most of the action, but Carinthia, in the South East, is well worth a visit. The food is influenced by its near neighbours, Italy and Slovenia, but the real gems are its collection of stunning lakes. I fly into the region’s capital, Klagenfurt, sitting on the eastern end of Lake Wörthersee, the largest in Carinthia. I follow its shores westward for ten miles alongside waters that have turned a deep turquoise in the early evening sun. I’m bound for Lake Millstätter See and suddenly as I crest a ridge, it’s spread out in front of me, hemmed in by high mountains with snow still visible on the distant peaks. Although at over seven miles long, it’s only Carinthia’s second largest, it’s the deepest, plunging to 146m. So clean that they say you can drink it, and full of freshwater fish. 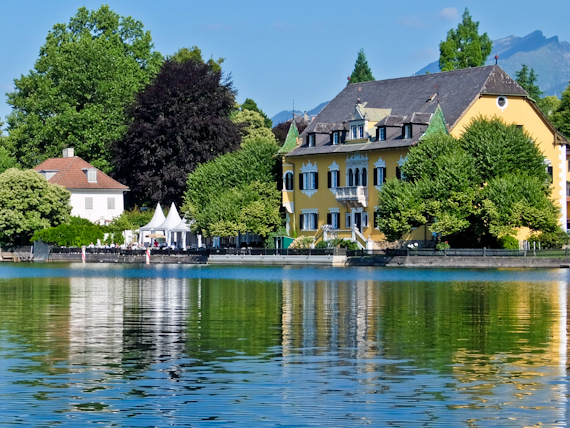 I’m staying right next to a lake in the charming See-Villa, built in 1884, and one of a number of country houses built to cater for aristocrats when they started coming here from Vienna in the 19th century. The hotel has been in the hands of the Tacoli family for the last 40 years and it shows in the efficient way they run it. The restaurant has tables right on the water’s edge, a delightful opportunity to observe the lake in its many moods. It’s also surprisingly warm, since no glacial mountain streams drain into it, and temperatures can reach 25°C in summer. I get into the routine of a daily morning and evening dip. What they’re promoting here is peace and quiet, with the German slogan “Zeit zu Zweit”, although the English “Time for Two” doesn’t quite have the same ring to it. If you’re a couple, however, a table for two on a pontoon in the middle of the lake is a romantic option – each course is delivered by boat. You can also stay in one of seven Bivaks, scattered around the lake, a sort of luxury bivouac in a wooden shed. Inside there’s a large double bed and windows in the roof so you can observe the stars as you edge into deep sleep. 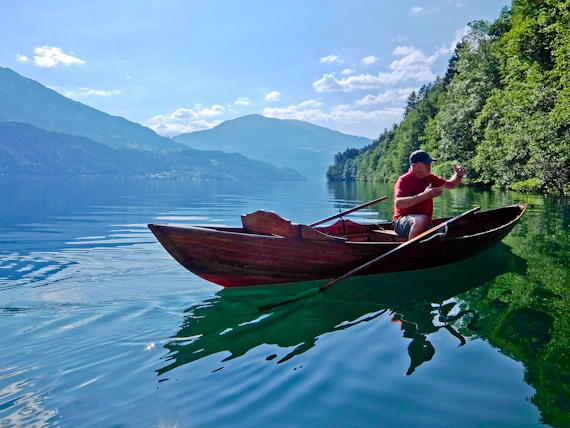 An early morning antique rowing boat trip, across to the unspoilt south side of the lake, is an opportunity to admire the fish in the crystal clear waters, with birdsong the only sound. Motorboats are restricted and you can happily swim across the lake without fear of being mown down. 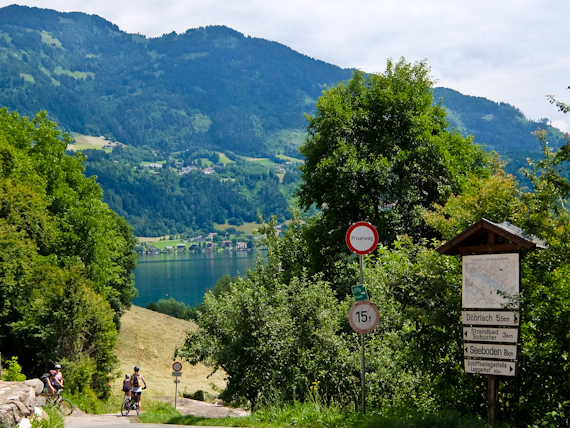 E-biking is also popular and a circuit of the lake is a pleasant way to spend a morning. Being Austria there are plenty of cafes on the way offering draught beer, sausage and cheese and, of course, Apple Strudel. I’m here for sterner stuff, specifically a section of the long-distance Alpe Adria Trail, running through here on its way to Slovenia and Italy. 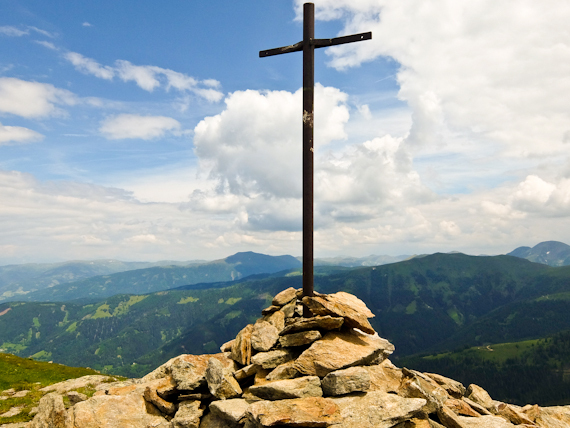 I’m planning to cross the Nockberge Mountains, so leave the lake at Seeboden and climb up to the summit of Tschiernock, at 2088m, topped with a large cairn and a huge cross. The lake lies below and there are tremendous mountain views right across to Austria’s highest mountain, Grossglockner, in the far distance. From here it’s an easy ridge walk over the Hockpalfennock and Tschierwegernock peaks before descending steeply to the Alexanderhütte for lunch. They make their own cheese and butter here, with milk from their cows, happily munching quality grass outside. Their speciality is Arnica butter, as yellow as the flowers the cows eat, and ideal to accompany their Harber Kas, a dry strong curd cheese, more like a powder. 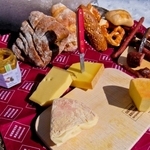 For the hungry hiker, it tops a thick layer of the butter covering homemade black bread. This is fuel for yet another climb on the “Weg der Liebe”, or “Walk of Love”, marked by inscriptions and quotations and a wall where people can write their own stories. It crosses Milstatte Alpe at 2091m before reaching the huge Garnet Gate, its metal frame studded with the red gemstones. The area around here is full of them and they’ve been mined for centuries. After the summit of Grannator, just ahead, it’s downhill all the way back to the lake at Döbriach. Next day I spend the morning relaxing at the Badehaus, a new spa complex right by the lake. A spell in the sauna eases my aches and pains from the previous day’s hiking, and a dip in the waters gives me an appetite. 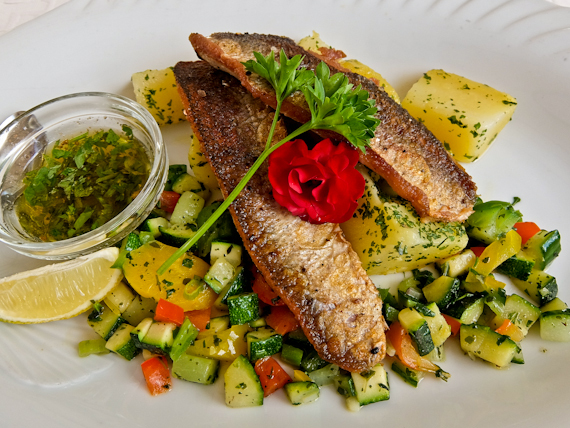 Although trout and pike perch are plentiful, the lake’s delicacy is the Reinanke, prosaically translated in English as White Fish. In the mid-nineteenth century, it caught the attention of the Emperor and he selected the Bacher family to supply the Imperial court in Vienna. Their descendants still have the fishing rights and every morning they check their nets. They’re known as the “Reinanken Fishers – Imperial and Royal Court Fishers of Lake Millstatt” and the Famielen Post is one of the few restaurants where you can sample it. The fish can’t be farmed, thriving only in the cleanest of waters and feeding on plankton in the lake. It’s particularly rich in Omega 3, so of course, I have it three ways as a starter, then a pair of fillets for the main course. As I tuck in the owner, Herr Sichrowsky, comes over to tell me that he was out on the lake this morning fishing my lunch. This is definitely one that didn’t get away. 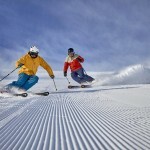 Visit Carinthia has information about the region. Milstätte See has information about the lake. Austrian Airlines flies to Klagenfurt from London Heathrow via Vienna. The Bradt Guide to the Alpe-Adria Trail has detailed information about the trail, including accommodation and dining options. 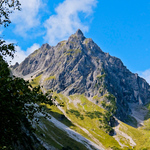 The Alpe-Adria Trail – Hiking in the Garden of Eden is a comprehensive online resource and you can download a useful App to help you find your way.